Phew. Big push this past week. I found installing the roof beams to be very rewarding work. The frames spanning the width of the boat are made from laminations of 1/4″ ply. After test fitting the pieces I glued them together and then removed notches to fit the longitudinal frames. Once the laminations had cured I used clamps and a few temporary wood screws to hold the frames in place while they were installed in the boat. I used some nice Quebec hard maple for the logitudinal frames. I’ve heard that maple has a tendancy to stain when wet but figured that most of it will not be directly exposed to the elements. Time will be the judge of that decision. Anyhow, once these frames were glued into the notches in the roof beams I used a planer to ensure the deck will sit flush upon the frames. When constructing the framing for the deck hatch I thought I’d try to gain an inch or two in headroom beneath the hatch by mounting it on the level (as opposed to following the deck’s cant). This will mean that the forward end of the hatch will sit a little higher and may be a bit more exposed than it would have been. Hopefully it won’t look too out of place either. Looking great. Is that “Decking” material next to the boat in the photo? That it is. Well it’s the “core” anyway. (1/4″ ply). I forget what weight the cloth is to be. 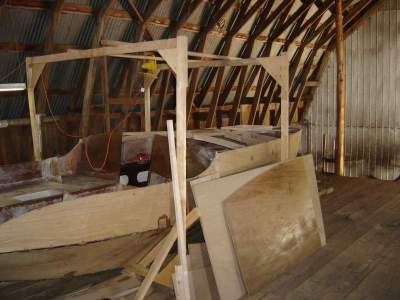 I’m doing a blog about boatbuilding too… do you mind if I link to you? ozzyc, fer sure. Link away bro. This has to be you, right? Cool. I’ve been following your progress. That’s going to be one sweet cruiser.